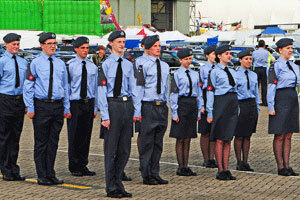 RAF Air Show Display Pilot turns out to be a Prince amongst men! Airscene found themselves in the vanguard of the Royal Press Pack at the RAF Cosford Airshow, when the most popular member of the Royal Family, joined his colleagues to present a demonstration of casualty evacuation. 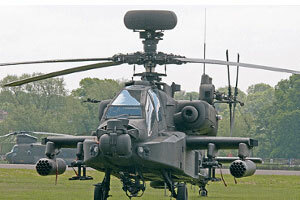 By pure luck, I had positioned myself away from the more crowded areas and had set up opposite an Apache parked at the very end of the flightline. My decision turned out to be very lucky one, indeed, for only those, privy to such security sensitive information, knew that HRH Prince Harry was taking part. 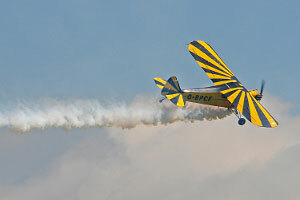 Even when the MC announced that the Apache crew included Captain Wales, the crowd didn’t seem convinced and many assumed it was a joke – but more of that later. 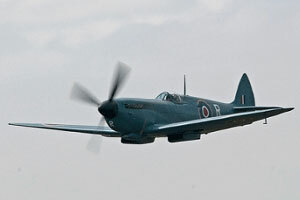 The morning had started with almost complete traffic gridlock with 4 miles of queues on the hard shoulder of the M54 and cars were still trying to get into the airfield some considerable time after the displays had begun. 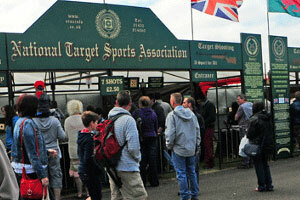 It was only to be expected as, a few days earlier, the organisers confirmed that ticket sales had broken all previous records. Although getting onto the airfield was a lengthy process, I was early enough to take some time wandering around the static displays. Cosford has quite a collection of Jaguars which are used by the engineering apprentices for practical maintenance and servicing experience. Some are kept in taxi condition and are cleared up to a limit of 80% power settings on the engines. Several hangars were open for public viewing and with plenty of retail stalls, fairground rides and simulator experiences, there was something for everyone. No long walks for conveniences with numerous toilet blocks having been placed at strategic locations in various areas. 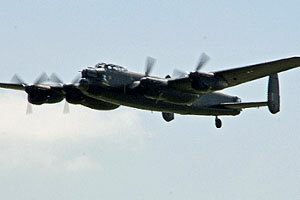 The flying began, as is the normal practice at Cosford, with the large scale model aircraft display. As the traffic onto the airfield was still extremely heavy, it was a useful curtain raiser while spectators were arriving and were probably worried about being late for the Main Display. I am always averse to just listing the participating aircraft in these reviews. That information is available on line. I do, of course, understand that some enthusiasts follow specific aircraft throughout the season and like to confirm the appearance of their “pet” aircraft and, sometimes, even aircraft we see regularly can be different beasts - depending on the display pilot flying that day. This year is the 75th Anniversary of RAF Cosford and so as a taster of things to come – the Chipmunk and the Bulldog flew a good formation display in celebration of the station’s birthday. The RAF Parachute display team, The Falcons, made it all look so easy and very casual when, as usual, they all landed on target from a reduced altitude because of cloud cover. The same cloud cover that quickly burned off, producing a bright sunny afternoon for the rest of the day. Like noise at an airshow? 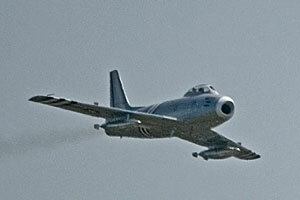 Then there is one cutting edge aircraft that is guaranteed to provide it. Correctly announced as the Typhoon, it seems that there is concern that the “Eurofighter” name continues to be used – it is the Typhoon NOT the Eurofighter we were told, in no uncertain terms, by the commentator! And what a noise it made. 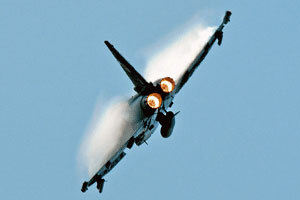 For performance and agility, the Typhoon probably leads the world and will continue to do so - until the next generation of aircraft come into service. 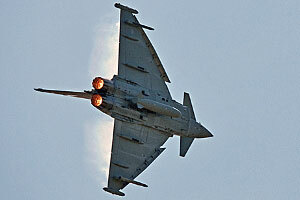 This advanced plane will remain the high-tec mainstay of the RAF and no-one could fail to be impressed by the display. Following the Typhoon, YAK aircraft filled the sky with their impressive demonstration as they employed what might be described as “opposition” aerobatics, splitting the flight up into two separate but converging groups of aircraft. The afternoon wore on with continuous flying and high quality airmanship and the anticipation was building as we were treated to the delights of the BBMF Lancaster and her escorts – the Spitfire and Hurricane. They were followed by the F86 Sabre, an immaculate Jet Provost and the strangest behaviour you will ever see at an air display in the form of the Crazy Cub flown by an even “crazier” Mr O’Brien! Landing and taking off from his moving trailer with a landing pad only 4” wider than the width of the Cub’s undercarriage, Crazy O’Brien flew the wing-shortened Cub in an absolutely fantastic display of how not to behave when you are invited to fly at an airshow. Seriously, the performance and his flying skills when throwing the specially adapted Cub around at very low levels and fairly close to some very expensive hardware. Then the three highly anticipated program items. With the Apache flying top cover, there was demonstration of casualty evacuation by the Chinook which showcased the agility and handling qualities of this long- serving giant workhorse. 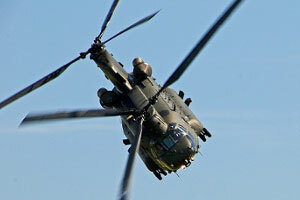 The Chinook was first used in Vietnam and since then, has undergone many modifications and improvements. In fact, Boeing have a special production line where older Chinooks are rebuilt and brought up to the latest specifications. When they come off the line, they are similar in almost everyway to a new aircraft. With old analogue systems being replaced with the latest digital technology and engine power being significantly increased, they are confident that there is no technical or practical reason why the the Chinook shouldn’t still be flying in 2050! 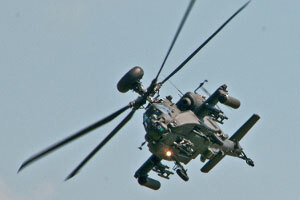 The Apache showed just why enemy forces fear this attack helicopter. 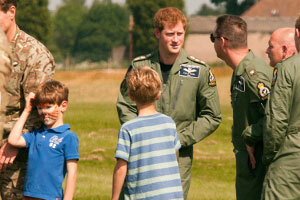 This was the first public display by Prince Harry and we were impressed. There is no doubt that, in due course, when other duties encroach into his flying career, he will be missed as much as any of the highly trained pilots currently providing air cover for operations in Afghanistan. 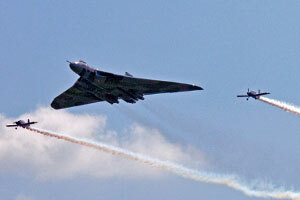 The arrival of the Vulcan was an unusual departure from the norm. 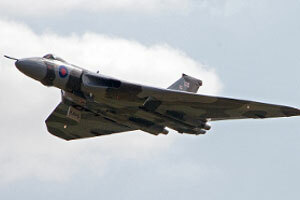 She arrived flanked by the two Av8tors aircraft who provided wing tip smoke for her entrance into Cosford. The entrance impressed on two counts – the noise levels from the Vulcan were exceeded by her escorts but more impressively, she was able to reduce her speed to that of the Av8tors as the three overflew the airfield in close formation. The Vulcan went on to give her more usual display and with news that she might continue to fly until the end of the 2015 Season was warmly received by the crowd – probably the same people who have helped ensure her continuing career with their donations. She was, having found a place in the hearts of the spectators, one of the stars of the show. 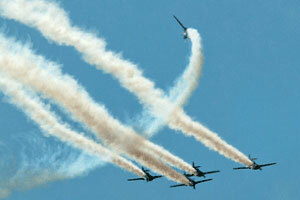 Now, like many of you, I believe we have the best aerobatic team in the world. Jim Turner and his colleagues have obviously been hard at it, honing their flying program and piloting skills in Cyprus,preparing for the return to a 9 ship formation – and it showed! 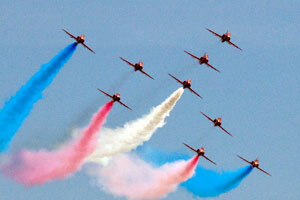 I refer, of course, to the RAF Red Arrows Aerobatic Team. Now, I am a staunch supporter of the Red Arrows but I had always thought that, eventually, they would run out of ideas for improving on their previous displays. Not a bit of it – they have introduced new elements and formations, but, what was particularly pleasing, was how tight and perfect everything looked. At least that’s how it appeared to the crowd but, knowing the Arrows like I do, I guarantee that they still picked up on various points at the post display debrief and will be working on those – something that goes on behind the scenes and that most spectators probably don’t appreciate! They seem to be well and truly over the tragic events of the last couple of years and the return to 9 aircraft optimises the display - they looked fresh and full of confidence. 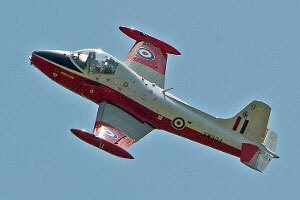 I look forward to seeing them display at RIAT where, I am certain, they will steal the show again! I returned to my car in what I thought would be an early departure. Some 2 hours later I was still sitting on the airfield in a stationery queue – fortunately the last displays were still performing so I had something to keep my stress levels within acceptable limits! 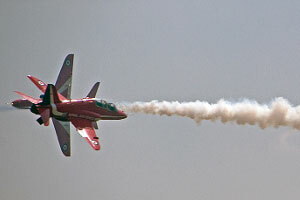 The organisers knew that ticket sales had broken all previous records for the Cosford show and will have to adjust the parking and traffic flow arrangements, next year. Being a warm day and with tempers fraying, without a solution, I feel many will be inclined not to attend if gridlocked parking areas become the norm at the end of the show. 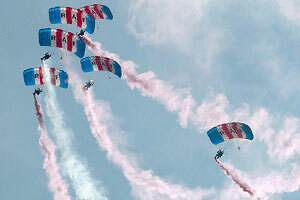 The RAF Cosford Airshow is set to become a major event on the Air Display Calendar and I would recommend it as a great day out for aviation enthusiasts and families alike.